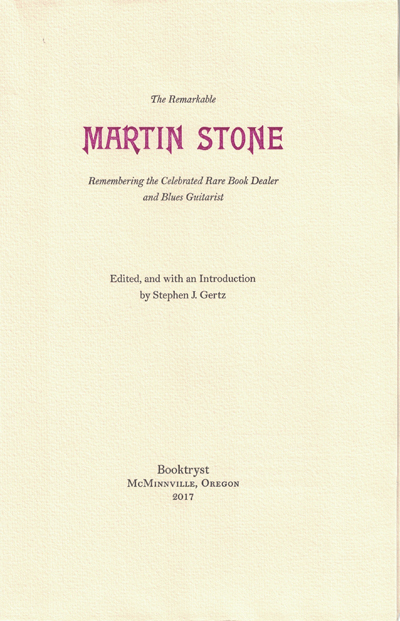 Booktryst is pleased to announce the publication of its newest book and first fine press edition, The Remarkable Martin Stone: Remembering the Celebrated Rare Book Dealer and Blues Guitarist. The edition is limited to 150 copies (of which 25 are hors commerce w/o hand-numbering), binding designed and text designed and printed by Alastair Johnston at Poltroon Press on Hahnemühle Ingres paper with type composed in Monotype Bell. It is bound by John DeMerritt. And it features an engraved frontispiece portrait by Frances Butler. Each copy is signed by the designer/printer, binder, and artist on the colophon. Nigel Burwood; Tom Bushnell; John Eggeling; Marianne Faithfull; James Fox; Peter B. Howard; Barry Humphries; Ed Maggs; William Matthews; Michael Moorcock; Jeremy Reed; Charles Seluzicki; Iain Sinclair; and Sylvia Beach Whitman. “From its stunning binding and elegant design to its superb, heartfelt writing, The Remarkable Martin Stone is a bibliophile’s dream. 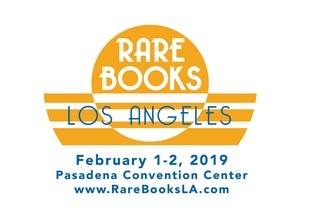 Seeing the legendary book scout through the eyes of those who knew him best--booksellers, writers, and musicians--gives us one final, glorious glimpse of a man who was charming and generous to the last. This is a book that anyone who knew, or simply knew of, Martin will hold dear; I know I will” (Rebecca Rego Barry, Fine Books & Collections). By Subscription Only, no billing. Books will be ready to ship in early December 2017. However, I expect the edition to sell out sooner rather than later, so order asap. Booksellers who wish to buy 3 or more copies for resale can purchase them at a 30% discount. You must, however, contact me directly; the discount cannot be granted through the buy option below. Net proceeds will be donated to the ABA Benevolent Fund, which provided assistance to Martin during his illness. The Remarkable Martin Stone. Remembering the Celebrated Rare Book Dealer and Blues Guitarist. McMinnville. OR: Booktryst, 2017. Octavo. 53, (1) pp. Engraved frontispiece portrait. Patterned Japanese cloth over decorated paper boards. Printed spine label. Cobalt blue endpapers. Plum cloth slipcase. $200. 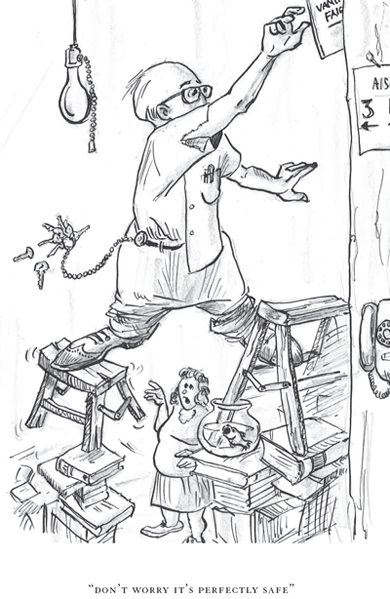 At the Megalopolis Book Shop, Mickey Tsimmis was all about customer service. No matter how potentially catastrophic the request (i.e. pulling a book from the shelves), Mickey was ready to sacrifice his life to help out. Coolly insouciant (or idiotic), he ignored the peril that was routine while navigating through the thicket that was Megalopolis. Danger was his business and to satisfy a customer no obstacle was too great to overcome. Scaling the shelves was an Olympic event in his jungle jumble of books, where organization was overrated and safety was for sissies. Illustration from The Wild Ride of a Hollywood Bookdealer by Arnold M. Herr, "one of the wildest rides since Thompson and Steadman (or perhaps Mr. Toad) took to the highway." Herr, Arnold M. The Wild Ride of a Hollywood Bookdealer. 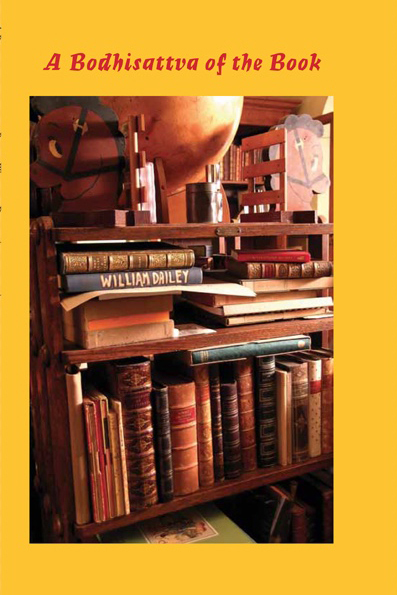 Berkeley: Poltroon Press in association with Booktryst, 2016. Octavo. Photo-illustrated wrappers. 136 pp. Illustrations by the author. BUY NOW.